Gift - Buy one save 10%(Only $14.99) on this SKYDEER Garden Glove in limited time! Enjoy shopping! Premium genuine deerskin suede provides ultra-comfort and fitting - No other materials can replace! 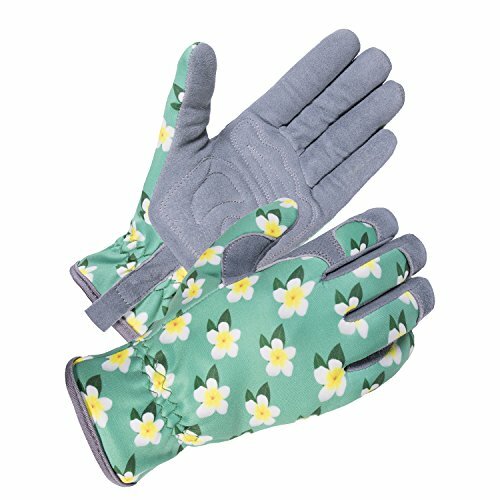 SKYDEER have advanced designs on this Women Garden Utility Glove to provide the best possible combination of durability, dexterity and comfort. It is perfect for work. Glove Feature Descriptions: Perfect materials combination provides Comfort, Safety and Durability! ➤ Material - Suede deerskin leather is naturally soft and flexible with good abrasion resistance. It absorbs perspiration and keeps your hands cool. ➤ Buttersoft Hands Feeling - deerskin gloves that fit like a second skin and no skin irritation. It will give your hand a good experience at work, your hands will remain clean and soft without constantly using a moisturizer to bring them back to their original state! ➤ Palm - Double foam padded palm patch can better absorb the shock and vibrationand relieves hand fatigue. ➤ Back - The Material of stretch and waterproof nylon back is soft, breathable and no skin irritation. It will give your hand a good experience at work. ➤ Wrist - elastic wrist keeps the glove closed around your skin and keeps dirt, debris out in outdoor work. And the comfortable elastic wrist provide perfect fitting and easy on/off. The glove to fit so securely on your hand and protect your hands from dirt, skin wounds and nasty splinters. In fact, they are exactly what professional gardeners use for maximum strength, durability and comfort. Enhance your work and gardening experience: protect your hands like professionals do! Premium Genuine Deerskin Leather Suede palm is naturally soft, warm and flexible, with good abrasion resistance. All materials are skin friendly and moisture wicking layers inside keeps your hands sweat free. Double Foam Padded Palm Patch and Buttersoft Hands Feeling - Deerskin Leather Palm is soft, breathable, and protects your hands from impact, abrasion when you are mowing the lawn, Pruning flowers, doing housework, fishing, gardening and more outdoor work. It is also provides extra grip and durability. Compared to other similar items in the market, this glove is more wearable, more comfortable and more reliable! Best Flexibility and Waterproof Back - The stretch and waterproof nylon material on the back provides breathability, dexterity and comfort. You can easily feel your hands working freely. High-quality waterproof nylon keeps your hands dry during the light rain and wild wind. In addition, reinforced finger tips and thumb may protect your fingers from any related potential hazards. One Size Fits All Ladies - Elastic Wrist Design - Slip-on cuff with comfortable elastic wrist provide perfect fitting and easy on/off. The glove to fit so securely on your hand and you'll be able to perform any number of tasks without taking the glove off. 100% money back guarantee: your gloves are backed by our unconditional 90 day guarantee. Order now with confidence. If you have any questions about this product by SKYDEER, contact us by completing and submitting the form below. If you are looking for a specif part number, please include it with your message.